While I’m on the subject of peat, I’m going to give my thoughts on one of my new favorite winter drams – Bowmore Small Batch Bourbon Cask Matured. I haven’t written much on the blog about Bowmore, the oldest distillery on Islay, and that is mostly because I have never been a Bowmore lover. That is not to say there aren’t Bowmore whiskies I like, but it’s hardly my favorite Islay distillery. I enjoy Bowmore 18 year, I have tried some very good independently bottled Bowmore juice, and The Devil’s Casks releases have been some home run hitters. However, all of the aforementioned whiskies are expensive and not always easy to come by. Thus, I have not discussed Bowmore a lot. Hopefully today’s review makes moves in an upward trend. Bowmore’s new small batch bourbon cask release replaced their Legend bottling here in the United States. Like the Legend, this is readily available and moderately priced. However, although neither has an age statement, I suspect the new Small Batch release has a higher percentage of some older whisky in it, as well as a higher percentage of whisky from first-fill bourbon casks. I have no facts on that, just a hunch. Bowmore Small Batch is bottled at 80 proof (40% abv). The color is darker than I would expect from exclusively bourbon cask maturation leading me to believe that there is some caramel coloring in this bottle. The nose here is not what I was expecting, it lacks the burning plastic note I get out of some young Bowmores. Here, there is lime, honeysuckle, brine, sea spray, and damp earth. It is really a delightful nose, although a bit thin. The palate is light to medium in its body. It enters with a big citrus note, salted oranges and lime zest. It rolls into vanilla, lightly smoked earth, and salted caramel. The finish is medium in length, with some barbeque, lime zest, and soft peat smoke. Overall, this is a light whisky, but the flavors are in good balance, although they are not all that intense. I probably would not pick this out as Bowmore juice were I to have tasted it blind; it lacked some typical Bowmore markers for me, which is a good thing for me because I have not always enjoyed Bowmore juice when I have tried it in the past. This is a fine whisky, and I highly recommend it if you are someone looking for a lighter introduction into the magical island of Islay. My grade: B-/B. Price: $30-35/750ml. Definitely a step-up for Bowmore’s base malt range, and a great value buy. Well, it’s St. Patrick’s Day, and when you have a whiskey blog, you are supposed to review an Irish dram. That is just the way of things. So today, I am reviewing Teeling Small Batch, a wonderful Irish whiskey from Teeling in Dublin. I have yet to determine whether all of the whiskey in this batch was distilled in Dublin or not, but I have heard rumors that this blended whiskey uses about 65% malt compared to only 35% grain whiskeys. So, if anyone out there can help out a misguided American on St. Patrick’s Day, I’d be much obliged. What I do know is that the bottle I am enjoying was bottled in May 2014, and it was finished for 6 months in ex-rum casks, although there is no age statement on the bottle. However, what I like most about this whiskey is the craft presentation; it is bottled without chill filtration at 92 proof (46% abv). The nose is wonderful, with apples, cinnamon, gingerbread cookies, molasses, pears, honeysuckle, and potpourri. The palate is medium-bodied and quite dry, but it still maintains the classic silky smooth Irish whiskey texture. The flavors that emerge are spicy and sweet, with some clove, cardamom, cinnamon, apples, molasses, and sawdust. The finish is sweet with pears, vanilla, and a bit of honeysuckle, lingering with some drying orange and lemon flavors. Overall, this is a gem of an Irish whiskey. The rum finish adds a drying spiced quality to the spirit that beautifully complements the sweet flavors of the American oak aging. As I have worked through this bottle, it has opened up pleasantly, revealing deeper and more complex flavors. Teeling does have a few other whiskeys released, but so far, this iteration is the only one available in the U.S. I did receive this bottle as a St. Patrick’s Day gift, but I would absolutely purchase another bottle. My grade: B/B+. Price: $40-45/750ml. There are a lot of Irish whiskeys around this price point, but I have yet to come across one that I enjoyed as much as this one. Since today is Memorial Day, I thought it important to review an American spirit, specifically a Kentucky Straight Bourbon Whiskey. Perhaps no distillery in the United States is synonymous with bourbon in the way that Jim Beam is, which is why I have chosen today to review Baker’s, the final member of Jim Beam’s Small Batch Collection left to review on the blog. I have already reviewed Basil Hayden’s, Booker’s, and Knob Creek, and they are all solid bourbons. 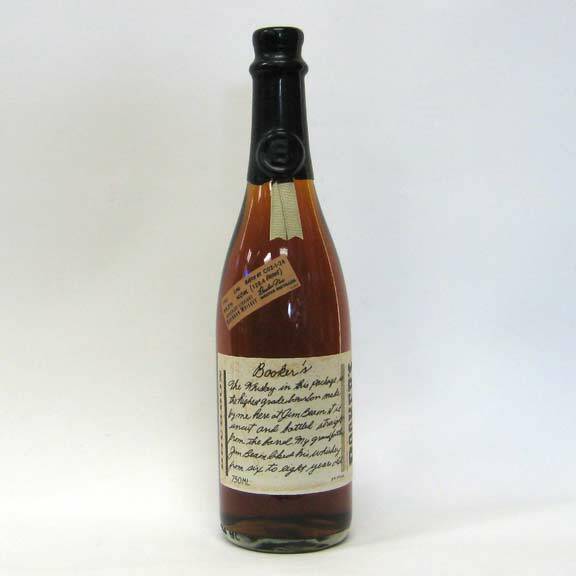 Baker’s is a 7 year-old Beam bourbon, and it is bottled at 107 proof (53.5% abv). Upon pouring a measure of Baker’s, the dark amber in the glass is truly beautiful, as is the smell wafting out of the glass. On the nose, Baker’s is a pure bourbon nose of caramel, cinnamon, corn, leather, and oak. The palate has a medium to full body, with caramel, black peppercorns, oak, corn, deep vanilla, and some bitter tannins. The finish is slightly bitter, but sweet enough to round it out with corn, caramel, and some lingering vanilla sweetness. Overall, Baker’s is straightforward bourbon with a lot to offer if you love bourbon. If you are not a bourbon fan, then this bourbon is likely to change your mind. It is deep, robust, and pleasantly sweet. The added proof gives it nice depth, and the depth is indicative that this is quality bourbon regardless of how “small batch” it actually is. This bourbon won’t blow your mind; it will merely remind you that tradition and quality make for good bourbon. My grade: B/B-. Price: $35-40/750ml. If there is a beef to have with this bourbon, it is that there is nothing that especially stands out about it, and it usually runs for close to $40 a bottle. Sorry for the break in posts, folks, but a few new jobs have made life rather busy of late. Today’s review concerns a relatively new small batch bourbon from the Heaven Hill Distillery: Evan Williams 1783. There is no age statement on the bottle, but Heaven Hill claims that this bourbon is “extra-aged,” but that is hardly an official term. As far as the term “small batch” on the label, Heaven Hill claims that each batch of this bourbon has a maximum of 80 barrels dumped; I will let you be the judge as to whether or not that constitutes a small batch bourbon. All that said, this bourbon continues on the tradition of well-priced whiskeys from the Heaven Hill Distillery. It is bottled at 86 proof (43%). On the nose, Evan Williams 1783 presents a classic Heaven Hill bourbon flavor profile. Soft and pleasant, there are notes of caramel, vanilla, and freshly cut oak. The palate is soft and mellow, with classic notes of caramel, vanilla, and oak, but with a little herbal underbelly. The finish is short and sweet with a slight tannic bitterness offsetting the sweet caramel. Overall, this is a very enjoyable bourbon, perhaps a dangerously drinkable bourbon. It is not overly complex or hard to understand, which makes it a great bourbon to start your bourbon journey with, or keep around the cabinet for those events when not everybody is an experienced bourbon drinker. My grade: C/C+. Price: $15-20/750ml. Truth is, this is one of those really solid bourbons under $20 on the market today. Today, I am reviewing two bourbons that I have been asked about a lot over the past year and a half – the Four Roses Limited Edition Small Batches from the last two years (2012 and 2013). Each year, Four Roses releases two limited edition whiskeys. Every spring just before the Kentucky Derby, Four Roses releases their Limited Edition Single Barrel. Every fall, Four Roses releases their Limited Edition Small Batch, especially blended for the occasion by Four Roses’ Master Distiller, Jim Rutledge. Each year, the bourbons that are blended together are different recipes and ages, meaning that each year, there is a different flavor profile. The Limited Edition Small Batch bourbons are different from Four Roses Small Batch, which is always comprised of the same four bourbon recipes. As you may have guessed, neither of these two Limited Edition Small Batch bourbons are particularly “bargains,” but they are both retailed at under $100 for a bottle, which puts them just within the upper limits of my price range for bourbons on the blog. Before I get to the review of these two wonderful bourbons, I should say a few words about Four Roses’ ten bourbon recipes. Four Roses uses two different mashbills, one with a medium rye content and one with a high rye content. In addition, Four Roses uses five different yeast strains. If you are statistics wizard, you have already realized that Four Roses has ten different combinations of grain and yeast at their disposal. It is the quality and distinctive flavors of these bourbon recipes that allow Jim Rutledge to create some of the best bourbons you can buy. If you want to know all there is to know, check out the Four Roses website. The first bourbon I am reviewing is the 2012 Four Roses Limited Edition Small Batch. It was made from four different bourbon recipes, expertly blended together by Jim Rutledge. The oldest bourbon in the batch was a 17 year-old “OBSV,” made from Four Roses’ high rye mashbill and their delicately fruity “V” yeast strain. The youngest bourbon used in the batch was the same exact recipe (OBSV), just an 11 year-old version. The final two recipes used were a 12 year-old “OBSK” (high-rye mashbill with spicier yeast strain) and a 12 year-old “OESK” (low-rye mashbill with the spicier yeast strain). These four bourbons came together at barrel strength (111.4 proof, 55.7%abv) to create a brilliant bourbon. On the nose, this bourbon is rich and full, with a healthy dose of cinnamon, backed up by French toast (with maple syrup), caramel, vanilla, oak, and a whiff of floral scent. The palate is full and rich as well, with a nice bit of heat at barrel strength. It is quite sweet, with vanilla, strawberries, black cherries, but it moves to spicy wood and hot cinnamon. The finish is very long and very delicious, the highlight of this bourbon. It starts spicy and woody (with a bit of cigar box), but it fades to a gentle vanilla custard with strawberries after a few seconds. It goes on and on. With water, the nose gets a freshly-cut cedar note, and a lot more floral. Even with water, this whiskey is still hot and delicious. That cinnamon spice doesn’t leave, but there is a little more caramel in the mouth and a bit of rye in the finish. Overall, this is a phenomenal batch of bourbon. It is delicious and incredibly balanced and complex. Nothing is overpowering, and everything works together. It gets even tastier as it empties in the bottle, with the sweetness coming to the fore more as the spiciness fades. It never loses its complexity, though. My grade: A/A+. Price: $80-90/750ml. Quite simply, this is my favorite bourbon that I have ever had the pleasure of enjoying. Now, onto the long awaited 125th Anniversary bourbon that was the 2013 Limited Edition Small Batch. After tasting the earliest blending experiments, Jim Rutledge reportedly said that this was the best bourbon he had ever made. That, in combination with the success of the 2012 LE Small Batch, made this bourbon a very difficult one to find. Luckily for me, I was able to snag a bottle. This bourbon is comprised of three different bourbon recipes at three different ages. The oldest bourbon used in this small batch was an 18 year-old OBSV, very old for a bourbon. The other two bourbons were both 13 years old, an OBSK and an OESK. The result is quite a unique, and very delicious bourbon bottled at barrel strength (103.2 proof, 51.6%abv). On the nose, this bourbon is fantastic, probably the most potent nose I have ever encountered in a bourbon. As soon as I cracked this bottle open, a sweet, vanilla, floral aroma filled the room, screaming to be poured and savored. There are also notes of sawdust, tobacco, leather, and cherry cola. It is a creamy nose that balances sweet notes, floral notes, and old, rustic bourbon notes almost perfectly. The palate is full-bodied with a lot of those same cherry cola notes, rounded out by vanilla, red velvet cake, Virginia pipe tobacco, strawberries, and dark chocolate. The finish is medium-length with oak, cedar, and vanilla. With water, the nose evolves into some citrus notes, and some more antique notes come out (many leather-bound books and rich mahogany if you’re Ron Burgundy). The palate gets sweeter and loses some complexity with water, bringing out a lot of cherry notes that I don’t like as much. Nevertheless, it is still a very good bourbon however you choose to drink it. My grade: A/A-. Price: $90-100/750ml. This is delicious, old, deep bourbon that just leaps out of the glass and fills the room. Overall, I really like the 125th Anniversary bourbon, but not as much as the 2012 version of the Limited Edition Small Batch. The 2013 bourbon is definitely older with more wood influence, and more elegance. However, I prefer the sharper, more complex (in my opinion) profile of the 2012 edition. That is not at all to say that the 125th Anniversary bourbon is not a great bourbon, because it is. 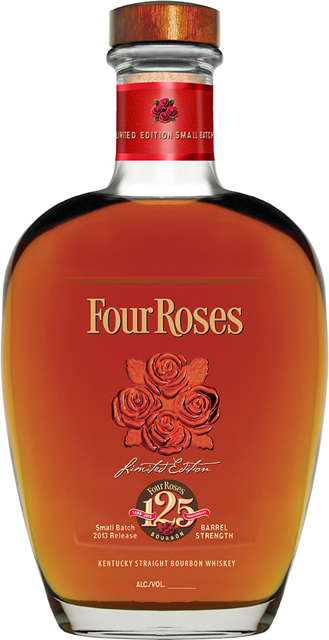 In fact, I suspect that many people with side with Jim Rutledge and say this is the best bourbon to come out of Four Roses because of the combination of sweet, fruity notes with old bourbon qualities. However, if I could buy but one Four Roses bottle again, it would be the 2012 Limited Edition Small Batch bourbon, as it was my favorite bourbon to this point in my life. Unfortunately, both of these bourbons are pretty hard to find on shelves nowadays, unless those shelves belong to a wealthy bourbon collector. With that in mind, the 2014 Four Roses Limited Edition line figures to be just as good, so be ready to jump on the bottles as soon as you see them. Much thanks to William at A Dram Good Time and Geno at Kappy’s for helping me get my hands on this year’s LE Small Batch! I recently did a review of Blanton’s Original Single Barrel for a friend of mine, in which I concluded that Blanton’s was a good bourbon, but it wasn’t quite worth $50 a bottle. A few people have asked me a valid question, “Is there any bourbon worth $50 a bottle?” Of course, the answer is up to you. However, to aid your journey, I’ve decided to do a comparison review of two bourbons that I believe are both worth $50 a bottle, Booker’s and Noah’s Mill. Both Booker’s and Noah’s Mill are usually priced at about $50 a bottle or so. They are also both high proof bourbons, with Noah’s Mill weighing in at 114.3 proof and Booker’s weighing in between 123 and 129 proof, depending on the batching. They are also both small batch bourbons, meaning they are created from combining different barrels together before they are put in the bottle. Booker’s is a bourbon from Jim Beam’s Small Batch Collection (Knob Creek, Basil Hayden’s), named after Booker Noe, James Beam’s grandson. As I mentioned earlier, this bourbon is uncut, and bottled at the same proof it is in the barrel. Booker’s is comprised of whiskeys aged between six and eight years, specifically from barrels placed in the center of the James Beam Distillery Warehouse. Although it is not the most popular bourbon from the Small Batch Collection, it is definitely the best in my opinion. Booker’s is done in very small batches, and it does vary from batch to batch. The particular bottle I am reviewing is batch C05-A-12, aged 7 years, 5 months, bottled at 128.5 proof (64.25% abv). On the nose, Booker’s reminds me of freshly baked cinnamon rolls. The nose is sweet, complex, and powerful. There are notes of brown sugar, apple pie, sweet oak, vanilla, toasted peanut butter, and light smoke. On the palate, Booker’s is full-bodied, yet surprisingly drinkable. Green apples, caramel, vanilla, charred oak, and some smoked fruits all blend together to form a brilliant mouth feel. The finish is long and very warming, but it is also full of flavor, achieving great balance between the oak and the sweet sugars of caramel and vanilla. In my opinion, Booker’s is one of the best whiskeys on the American market today. It is full, complex, and powerful in both proof and flavor profile. My grade: A-. Price: $45-50/750ml. This is brilliant bourbon, plain and simple. Right next to Booker’s on the top shelf is Noah’s Mill, a 114.3 proof, small batch bourbon produced by Kentucky Bourbon Distillers. Noah’s Mill is made from a variety of whiskeys at different ages from different mash bills and from different distilleries. Then, the whiskeys are blended and bottled to perfection by Kentucky Bourbon Distillers to create Noah’s Mill. On the nose, Noah’s Mill can be a little shy, but give it a minute. After sitting for a few, it will open up with a rich nose, displaying notes of toffee, caramel, and some roasted vanilla. The palate is sweet and drying, with the sweetness of vanillas and caramels being bolstered by dried raisins and cranberries. The finish is long and warming, just like Booker’s. There is a good amount of rye spice balanced with sweet, warming toffee and caramel flavors. In my opinion, Noah’s Mill is certainly deserving of its place on the top shelf. My grade: B+. Price: $45-50/750ml. This is a wonderful, big, robust bourbon, it just doesn’t quite have the life that Booker’s has. The one complaint that I have heard about both of these bourbons is that they vary significantly from batch to batch. Unfortunately, that is just one of the perils of small batch bourbon. Nevertheless, I have always found both of these bourbons to be fantastic whiskeys through and through. In the end, I definitely give the edge to Booker’s, although Noah’s Mill is still one of my favorite whiskeys. If I had $50 to spend on one bottle of bourbon, I would spend it on Booker’s with no hesitation. But, the best way to find out is to drink these whiskeys and see which one works best for you. Let it ride! I wanted to review this bourbon before the summer is upon us because it is definitely a summer bourbon. Basil Hayden’s is an 80 proof, 8 year old, small batch bourbon from Jim Beam’s Small Batch Collection (which also includes Knob Creek). The bourbon gets its name from Basil Hayden, a native Marylander who moved his community to (what is now) Kentucky in the 18th century. He is one of the first famous distillers, and many people credit Basil Hayden with being the first person to use rye grain in whiskey. Hence, his namesake bourbon is the only bourbon in the Small Batch Collection to use a high rye content in the mash bill. Basil Hayden’s is an interesting bourbon because it is only bottled at 80 proof, which is quite low for a craft bourbon. It is the only bourbon in Jim Beam’s Small Batch Collection to be bottled at less than 100 proof. This low alcohol content makes Basil Hayden’s very light-bodied and drinkable, the perfect whiskey for a warm summer day. On the nose, Basil Hayden’s is light, but crisp. There are peppery notes from the rye character, which is noticeable right up front. However, it is balanced well by dried fruits (mangoes, apricots) and some light floral notes. The palate is very light and smooth, with notes of vanilla, some light fruits, and a good dose of rye. The finish is very well-balanced, just like the nose. There are some notes of sweet pine nectar and dried fruits, but the rye spices are the highlight. However, the finish dies out quickly, leaving the palate stranded. Overall, Basil Hayden’s is a very good bourbon that is balanced all the way through. However, the low proof and light body make it a soft bourbon. The flavors are all there in good balance, but not good quantity. Every time I drink this bourbon, I am left wanting more. I would love to see what would happen if this bourbon was bottled at 90 or 95 proof. That being said, Basil Hayden’s is a delightful summer bourbon, especially if it is on sale. My grade: B-. Price: $35-40/750ml. This is a good standard pour, but it doesn’t quite have the full bodied complexity to be a great whiskey for me.